Héritage by Guerlain (1992) is the almost forgotten masculine from this legendary house. It smells slightly dated on my nose, with it smelling a bit like a watercolour on a Guerlain scale. Héritage too smells familiar, in a vaguely captivating manner much like all Guerlain fragrances are. However, this eau de toilette combines much of Guerlain’s past into a coherent whole piece of fragrant work – thus the name Héritage bares true. What this fragrance embodies is literally the fragrant heritage of Guerlain. It takes the female olfactory profile and then both translates and synthesises this into a modern masculine olfactory profile. Jean-Paul Guerlain, nose responsible, had proven to be one to agitate the conventions of male perfumery. Jean-Paul was particularly great at Guerlain masculine works, with Vetiver, Habit Rouge, and Derby all under his belt. Habit Rouge used sumptuous vanilla in a masculine perfume, which was unheard of until then. Habit Rouge served as perhaps a Shalimar pour homme, taking one important olfactory profile for Guerlain, vanilla, and making it very easy for men to wear and for women to adore it on them. 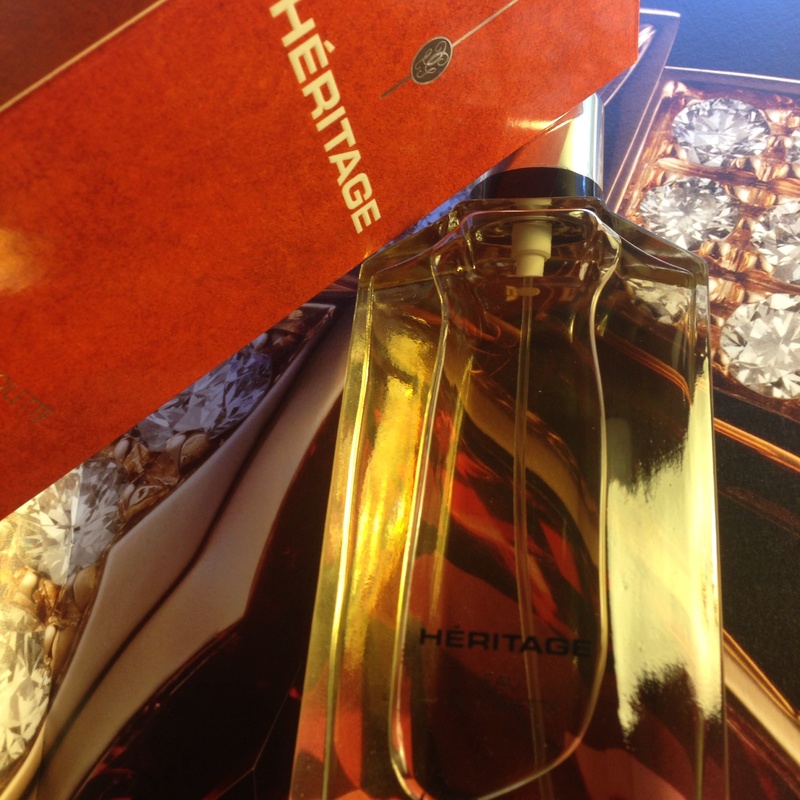 Carrying on from that theme, Héritage encompasses a much broader, yet very traditional Guerlain olfactory profile. The whole range was used, with the aromatic ‘herbes de Provence’/French herbs and lavender accord originally used in Jicky utilised; whilst vanilla and amber were also taken from both Shalimar and Habit Rouge. In addition, the use of woods and oriental ingredients call to mind other warm oriental Guerlain works – with sandalwood especially coming from a not so long ago 1989 release, Samsara. The beauty of Héritage could then possibly be equated to its familiarity. Its note list is familiar, and alone is nothing novel – however altogether it is magnificent. There’s a lot of layering going on with Héritage, a lot of contrasts. It comes to the point in which there is nothing but natural compliments of scent profiles occurring. This is great – and this is what I look for in most cases; masterful blending of single notes to form accords and then these accords then balancing amongst themselves. I find Héritage to be a masterfully balanced and blended fragrance, and is particularly wonderful lingering on the shawl of a woollen sweater or sprayed lightly on bed linen. Despite its comforting mix of lavender, amber and sandalwood, it comes to the point in which you look for something that jumps out a little bit. A hint of roughness; a little twist of the collar – so to speak. Its soft notes pulse lightly yet persistently throughout, creating an overall elegant scent. And yet, Héritage isn’t overall raw or alluring enough to jump out at you. This is a heartening fragrance. I enjoy the initial synthetic rush in the opening of slightly green and plastic notes (most likely a rough lavender) revealing a warm and cozy heart of amber nulled of both its liturgical and urinous qualities. It begins with a spicy richness with woody and ambery top notes, drying down to a powdery spiced vanilla base. With the soft addition of patchouli, the fragrance is sweetened, with just enough glassy vanilla in the backdrop. A spicy sandalwood note exists and is peppered at this fragrance’s core. It is especially spicy due to an aromatic hum of coriander seed and a hushed pink peppercorn note. Nevertheless, these notes seem more like holograms in the end, which are rather hollow impressions of something that is otherwise a perfect replica. Sure, the dimensions are the same in the hologram, but there is no flesh and no bone. This is the case for Heritage – and I still love it for what it is. Héritage hints at richness, but remains forever transparent. This is a tentative thing of beauty. This is truly a Guerlain work of art, and bares the Guerlain mark of fizzy bergamot, and naturally fine yet bold streaks of delectable tonka bean and the revered addition of vanilla, rounded finally with oakmoss and contrasted with a sombre cedar note. The contrasting layers in this fragrance are like a jigsaw. They fit perfectly and they work; but in this case, do we miss the rough nonchalant elegance? At times Héritage can be uptight and crowded – but at other times it is a rewarding spicy woods scent. A pleasure wrapped in comfort, layered with notes, warmed with spice and folded with woods. Tranquil yet sturdily masculine. This entry was posted in Guerlain and tagged Fragrance, Guerlain, heritage, jean-paul guerlain, Perfume, Review. Bookmark the permalink.